The Alliance is a social and volunteer organization that is designed to raise awareness and support for Catholic Charities of Baltimore. We seek to engage Baltimore-area young professionals through networking, volunteer, and outreach efforts designed to promote and advance Catholic Charities’ mission to improve the lives of over 160,000 individuals and families in Maryland of all faiths, ages, and ethnicities. We invite all Baltimore-area professionals who are looking to have fun and network with the purpose of supporting one of our city’s most vital institutions. For more information about membership and events: www.alliancebaltimore.com or email: information@alliancebaltimore.com. Membership in 2019 is free to all. Catholic Charities of Baltimore is the largest private provider of human services in the State of Maryland. Every day, at over 80 programs at 200 locations throughout Maryland, Catholic Charities of Baltimore serves children and families, people living in poverty, individuals with intellectual disabilities, immigrants, and seniors. Among other things, employees and volunteers on behalf of Catholic Charities of Baltimore prepare and serve over 500,000 meals a year to people in need. Catholic Charities’ programs serve the following areas of need: behavioral health; community & neighborhood-based services; early childhood & special education; family support, foster care, and international adoption; housing and shelter; job training & employment services; immigration; intellectual disability support for adults; poverty relief; and seniors. The organization serves the following areas: Baltimore City, Baltimore County, Anne Arundel County, Allegany County, Carroll County, Garret County, Harford County, Howard County, Frederick County, and Washington County. 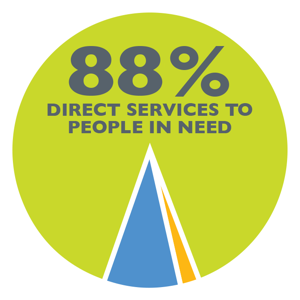 For every dollar donated to Catholic Charities, 88 cents are reinvested directly to serving those in need. All donations to Catholic Charities stay within Catholic Charities. The organization serves and employs individuals of every race, ethnicity, background and faith perspective.